Purchase the crochet patterns for the entire Woodland Granny Square Blanket in one compiled file here. Or find all the information and links to patterns to make this Woodland Afghan below. Winter is in full swing! Except it has been pretty mild here in Central Pennsylvania. I’m looking forward to snow and frigid cold days (I know, I can’t believe I’m saying this either). It’s just not Winter when the temperatures barely dip below freezing during the day – bring on the cold! 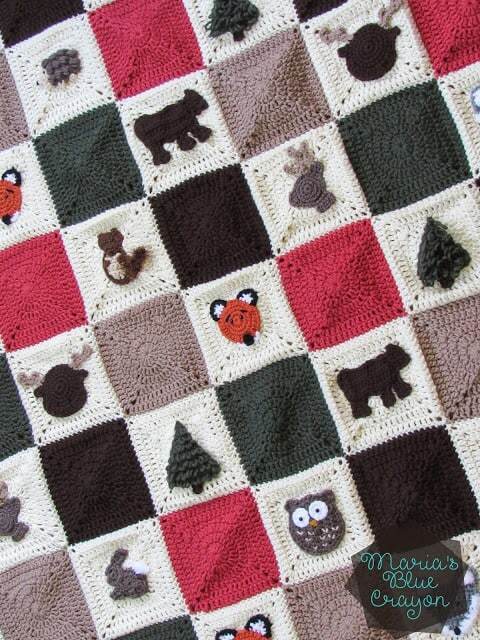 To convince the colder weather to come, I’m creating a Woodland Afghan comprised of granny squares, scattered with cute little woodland animals. Are you excited as I am? Woodland themed anything just gives me heart eyes, so I’m super excited about this afghan. Here you will find the pattern for the granny square base along with the links to the little woodland critter granny square patterns. I have mapped out what I would like my granny square afghan to look like on an app called PixelArt (this app has many other great uses such as graphing a picture for a C2C afghan or tapestry crochet). The lightest color (Aran) represents the squares I will have my woodland themed granny squares on, creating a checkered pattern. I plan on having 10 or so different designs so I will be making multiples of each one. That makes 63 squares total. The afghan will be 7 squares wide x 9 squares high, with each square measures roughly 7 inches. Using this pattern of squares, the afghan will be around the size of an average throw: 49″ x 63″ and that will not count the border if you choose to put one on. Buy the entire PDF download/printable pattern (granny square plus 10 appliques) on Ravelry. I added a border consisting of HDCs around (making sure to put 3HDCs in each corner). I did 4 rows of Aran (cream color), 1 row of Forest Green, and 1 row of Chocolate Brown. I’m so please with how it all came together! I have a knack for not finishing large project, so I’m patting myself on the back for this one. Thank you everyone for being so loving and supportive! My daughters kindergarten teacher is doing a woodland nursery then so I would love to crochet along with you. Are you making multiples of squares or all different? Could you elaborate on your granny square pattern by adding each row's stitch counts. I'm new to squares, but have been doing amigurumi for awhile. I'm guessing row 1 is 12, row 2 is 24, row 3 is 36, but then I get lost. Especially rows 5&6 with Dc across. I'm excited to make this with you, I live in a log cabin and need a great blanket for the living room! Absolutely! I added the numbers, I hope that helps! When you start row 5, you will DC across 12 (not counting chain 3) and once row 5 is complete, each side will be 14 DC across. For row 6 you will start with 13 DC across (not counting chain 3), and will be 16 across on each side once completed. Thanks that was helpful. I finished two squares and posted pics on Facebook. How much yarn should I buy to complete the whole project? Hi! I used the Loops & Threads Impeccable from Michael's. You will need two skeins of each of the colors: rouge, chocolate brown, taupe, and forest green. These skeins are 277 yards each. For the aran (the light cream color) I used two skeins of the larger balls which are 858 yards each. As for the animals appliques, you will need small amounts in colors that each pattern states. I am using Lion Brand Vanna Choice simply because I had some left overs in the colors I chose for the animals. I have not designed/released all patterns of the animals yet, so unfortunately I don't have the answer right now as to how much yarn and what colors for all the animals. How do I find the beginning of this pattern and how do I stay updated as new motifs are released? I absolutely adore this project! You will find right here on this post all of the information you need to complete this afghan! I am updating as I go and adding the links to the animal patterns once they are finished. 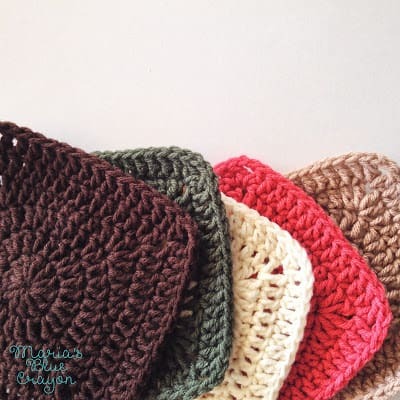 Here in this post you will find the colors you will need as well as how to make the granny squares. Links to the animal patterns are above each picture. I plan on adding how I will be joining these squares together when I get that far! I send emails when I have new patterns up! My son loves animals too! Part of my inspiration to create this blanket 🙂 I hope your son enjoys it once finished! This is beautiful! I first saw the moose and thought how great this would be for my future daughter in law because she loves moose. THEN I saw the rest and was so elated! I can't wait to see what else you come up with. Is there a way to keep up when new ones are made? I will certainly "Like" you on facebook and sign up for your newsletter. Great Job! My daughter and her husband are expecting their first baby in April. Both of them work for the Park Service. 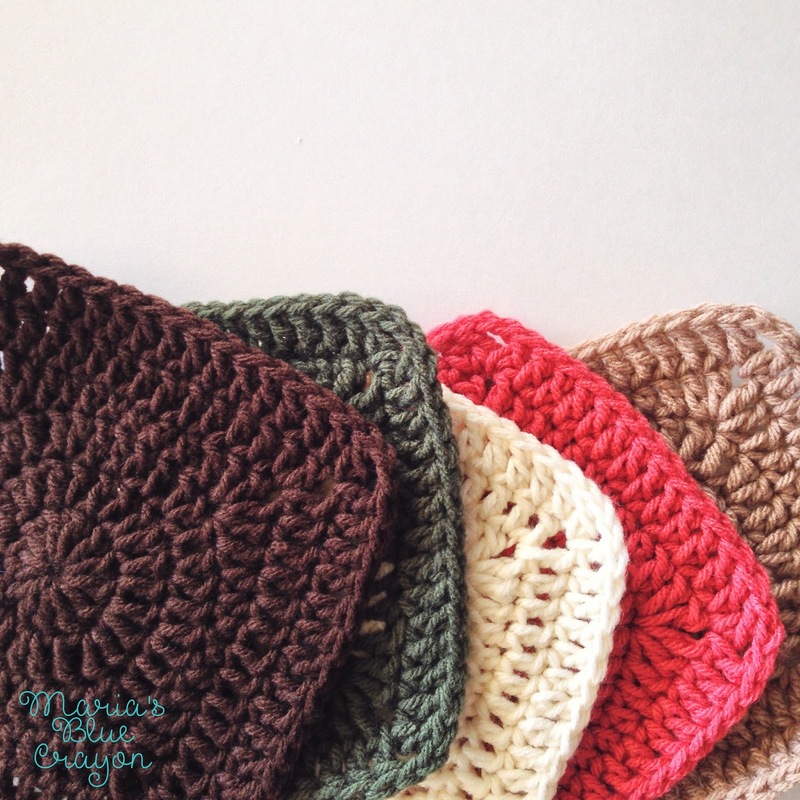 These squares will be PERFECT for a baby blanket for their little one! Thank you SO much for the patterns. Hi Maria! What technique are you planning on using to join the squares? Just wanted to thank you again for making this! I absolutely love it! Can you possibly make me a fish pattern? So excited to see what the next animal will be! I love this pattern, but I'm new to crocheting and having some issues. I made one square and am very happy with it. All squares I have tried to make since I just can not get right. Do you have any YouTube videos or could you possibly consider making one? Thank you again. Hi Rebecca! I do plan on making a YouTube video, but at this moment I don't have the time or the means to do so. Is there a particular part I can help explain in the mean time? I think I finally got the moose to a point that I am happy with it. My biggest obstacle is being left handed. I found that if I turned the moose to the backside and attached the antlers as if it were the front it worked out! It is a beautiful design!! Thank you for sharing. How are you going to layout the animal squares for putting together? I absolutely love your pattern for the granny squares and woodland animals! Is there anyway you can make a series of fishing type animals! Or ocean animals! Would love it!! Thanks!! The finished blanket is amazing! I'm making a smaller version of this blanket for my nephew (who will be born this May!) I'm new to crocheting and I'm just working on the squares. I'm having trouble where the corner that I start at is really round unlike the other three corners. Is there any advice you could give me? I know it won't be perfect but I don't want his blanket to be lopsided! Thanks! HI! you can try blocking the squares before you join them. Usually with granny squares this is done by taking 4 skinny rods (think skewers or skinny dowels) and place them on a base. If using skewers you could get away with just poking them on a piece of foam (something like the foam alphabet floor mats for kids). Place them in a square shape and slide your squares on so it stretches to the shape you want. I hope that helps! If that doesn't make sense let me know so I can clarify! Maria, this is so stinkin' cute. Thank you for sharing it. I will definitely be making it. I just finished making this for my niece and I'm amazed by the result! All of the patterns were very well written and easy to understand. Thank you so much! Could you tell me approx how much yarn is used for the Woodland granny squares. I'm trying to figure how much more Vanna's yarn would cost the Red Heart. Like Red Hart but Vanna's yard would be nicer for this project. Thank you. Did you crochet the squares together or did you just sew them together with the yarn? 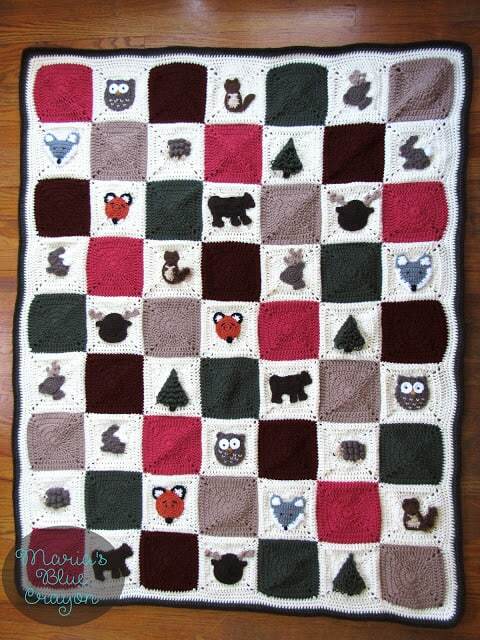 This blanket is beautiful even without the woodland creatures, but they are adorable! I love how you did the hedgehog! Is anyone else having problems with the granny square pattern? No matter how I do it I do not come up with 36 stitches for the 3rd row. I've tried both starting in the same space & the next alternating dc then 2 dc & I do not come up with 36 stitches?? Also all your ad stuff (Pinterest & drop "up" menu that you can't get rid of makes it very difficult to post something because it covers up the area you type in. You should rethink that & move it because it's very frustrating. And yes I have 24 stitches in my 2nd row and if you follow the pattern I and up 1 to 2 stitches short. For row 4, it may seem like you aren't able to squeeze in the last stitches, but it says to make those stitches into the beginning ch 3 space. May I ask what device you are using to comment? I don't have the issues of commenting on either my desktop or iphone. Would love to make the experience better for other devices, thanks! Love our Woodland square collection! I see many of your woodland photos are with pinecones around them. I was thinking a pinecone square would be a beautiful addition to your collection maybe? So sweet and woodsy, I just love it! YOUR woodland square collection. I don't know where the "Y" went in the word "Your". Sorry about that. Wish I could edit it. I saw your Woodland Afghan for the first time today,(on dailycrocheter.com) and really like it. I am not a fan of having to sew squares together, but I just may want to try this one. 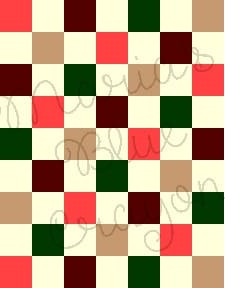 Do you have any tips on sewing/crocheting the squares together? I had bought this pattern a while back, but I am making it my fall/winter project. I would LOVE to see a dinosaur version of this kind of blanket though! I have a granddaughter that has animals (rabbit, goat, dog) so I am doing the Farm blanket and adding some different apliques such as the owl, a dog and other “critters”. My bear does not look like your bear so will try again.